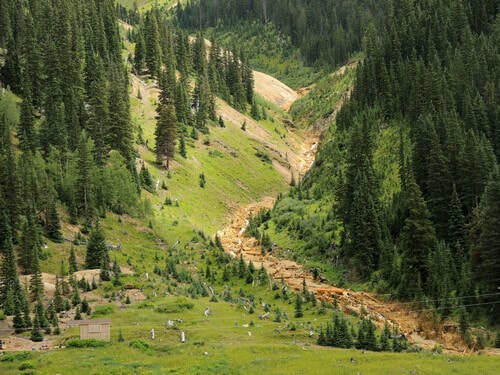 Eureka Gulch is a story about the Sunnyside Mine and associated Sunnyside Mill, about a disappearing lake and about a 2015 mine spill by the EPA that contaminated the Animas River for hundreds of miles. 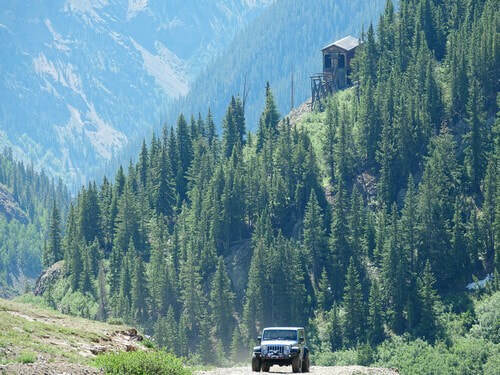 ​The Eureka Gulch Jeep trail takes off from the road to Animas Forks, about a quarter mile above the massive foundations of the Sunnyside Mill, at the Eureka townsite. The Sunnyside Mill was a monster in its heyday! Go up the road behind the mill and you will soon leave the South Fork of Animas River and enter Eureka gulch. Once you get past the tree line, keep an eye out on the south side of the gulch for remains of tram towers, the angle station, where the buckets changed direction, and the tension station, that kept the cables taught. The angle station was built as part of the second Sunnyside tram. It was necessary in order to turn the tramway cable, which came across the gulch from the basin above, to run down the gulch to the new mill. The tension station was used to keep tension on the cable span from the lip of the basin across to the south wall of the gulch. If you are looking at a topographic map when you reach the remains of the Sunnyside Mine in Sunnyside Basin, you will appear to be in the middle of Lake Emma. Of course there no longer is a Lake Emma. Story below. 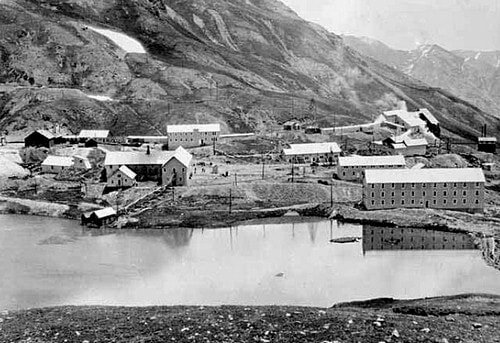 The Sunnyside Mine was located by Reuben McNutt and George Howard in 1873. They discovered the huge gold bearing vein exposed on the surface in what became Sunnyside Basin. 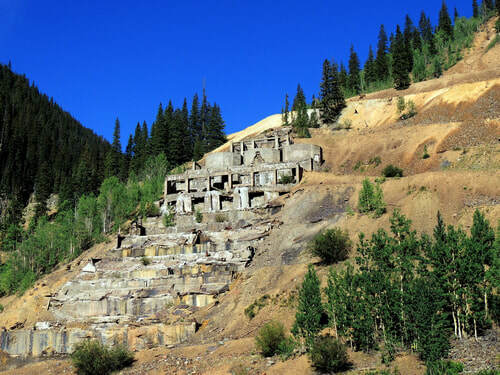 The Sunnyside Mine started in the late 1880's and closed 1930. Reopened 1937 and closed 1938. 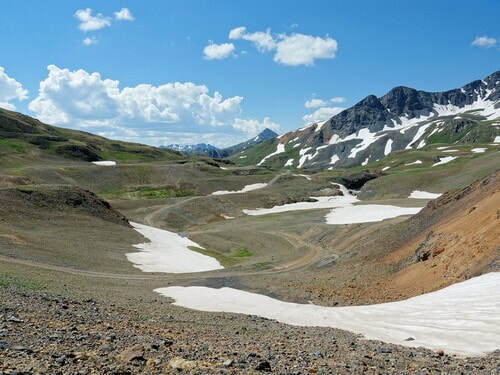 The original surface plant was on the shore of Lake Emma in a glacial cirque east of Bonita peak above 12000 feet. 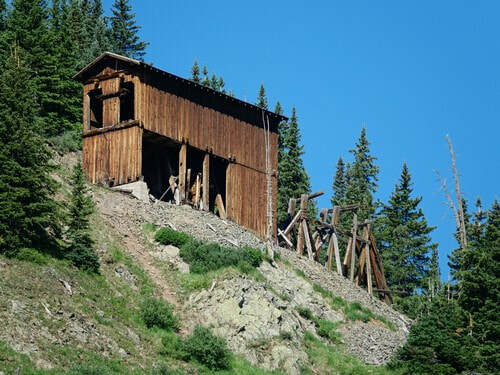 In the late 1890's an aerial tramway was constructed to bring the ore to the Sunnyside Mill at Eureka, 3 miles east of and 2000 feet below the mine. American tunnel was originally part of the Gold King Mine at Gladstone. On USGS topographic maps it is still labeled as such. Begun in 1900 some 800 feet beneath level 7, the Gold King's main operating level, it was only driven in about 700 ft. In 1922-3 the American tunnel was extended to 6233 feet from the portal, to a point beneath the Gold King's main workings, but the mine closed before any other development work could be done. After a long period of dormancy Standard Metals became the operating entity of the Sunnyside Mine and decided to access it from beneath through the American tunnel. 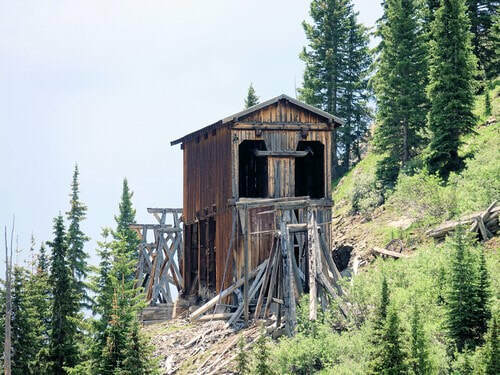 Between 1959 and 1962 the tunnel was driven nearly another mile to a point 1800 feet beneath the old workings of the Sunnyside Mine, a final length of approximately 11000 feet,. The American tunnel provided deep drainage and gravity assisted ore handling solving 2 major problems that had greatly increased costs and led to the demise of the original Sunnyside mine nearly 25 years earlier. On June 4th, 1978 (fortunately a Sunday) the bottom of Lake Emma collapsed into the upper mine workings sending a slurry of mud and debris through most of the workings. Production resumed after about 2 years of rehabilitation and the operation stumbled on through poor economic times until early in 1985 when Standard Metals sold the property. Production continued under the new operating entity, Sunnyside Gold Corp., a subsidiary of Echo Bay Mines, Ltd. Except for a 2 year rehabilitation hiatus in the wake of the Lake Emma disaster, the Sunnyside mine produced ore through the American tunnel until 1991 when depressed gold and base metal prices turned more ore into rock than could be tolerated. 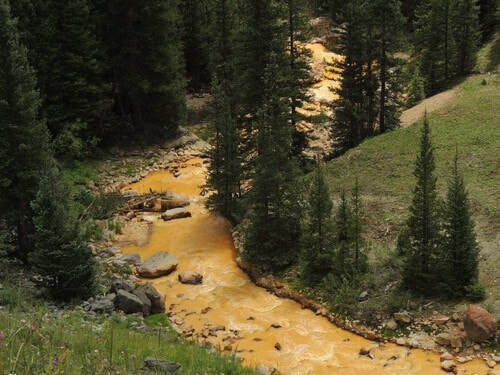 EPA was responsible for the "remediation efforts" mentioned above. ​We were in the area when the spill occurred. 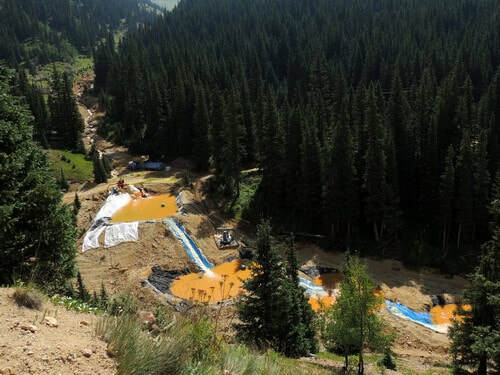 There was a lot of water that came out of the Gold King Mine. EPA attempted to clean up their mistake. Another quote. This one from narrowgauge.com. 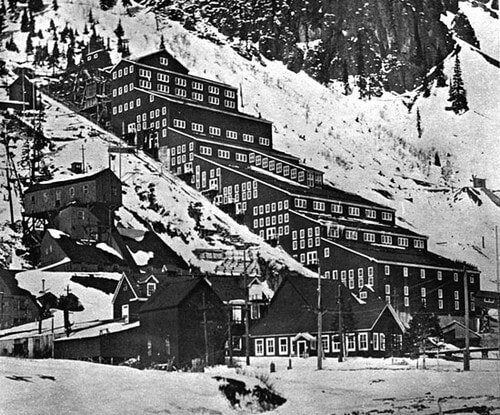 In 1959, the Standard Metals Corporation purchased the Sunnyside Mine, on the east side of Bonita Peak. They planned to work the Sunnyside Mine from the west or Gladstone side of the mountain. 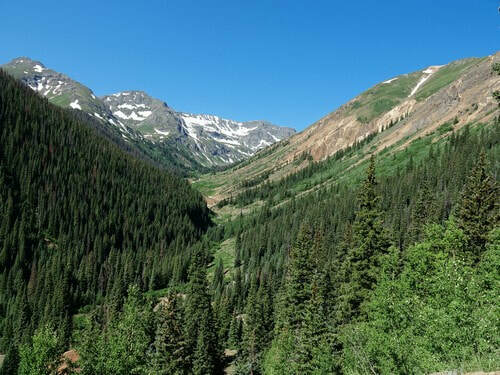 To facilitate this operation, they built which the American Tunnel which connected the underground workings of the two best producing mines in San Juan County. 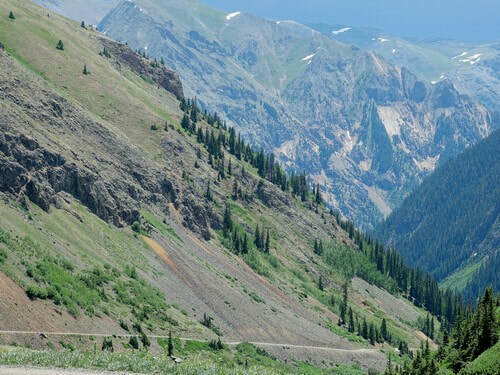 The ore was removed through the American Tunnel in Gladstone, and transported by truck down the old Silverton Gladstone and Northerly Railroad grade. 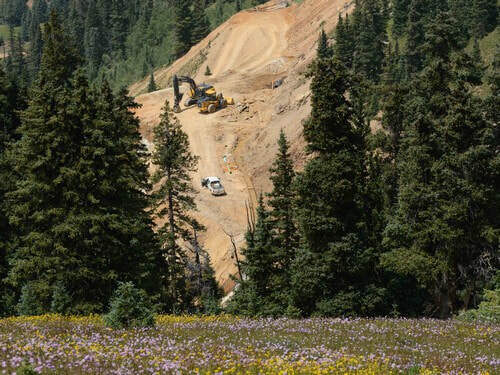 The grade was widened to accommodate the huge trucks and today looks like a four-lane highway. Standard Metals managed to "keep their heads above water" until 1978. All of that changed on a quiet Sunday evening in June. As you look at a map of the area that the Sunnyside and Gold King mines are located in, you will notice a small lake. 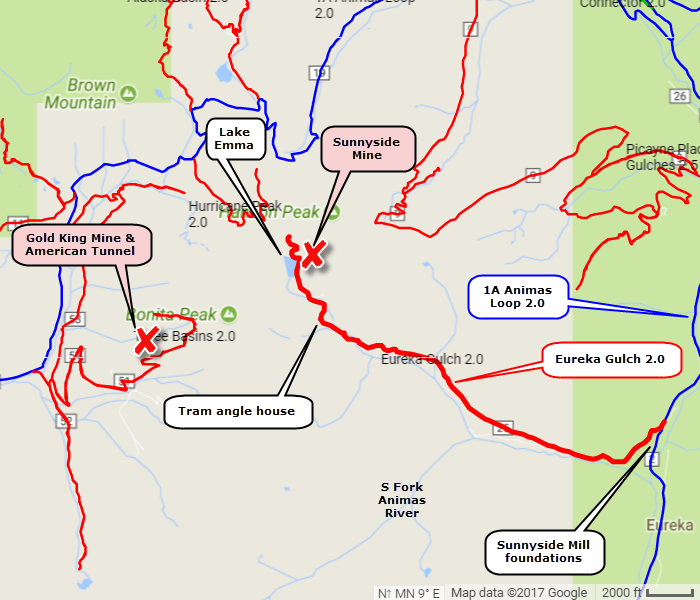 Lake Emma was located directly over the underground workings of the Sunnyside Mine. The old mine surface workings had for years been on the shores of the small alpine lake. As luck would have it, some of the most valuable ore in the Sunnyside was located directly under Lake Emma. This ore was very rich, and thus tempted the mine's owners over the years to mine the area under the lake. Eventually only 90 feet separated the lake and the underground tunnels. During the winter of 1977-78, a fault appeared in the mine under the lake. The fault began to leak a little water, and mud. As time went on, the crack got a little larger, and a little more water made its way into the mine. Many of the mines in the Silverton area had an underground water problem so it wasn't that unusual to see the water. Of course the location of the lake made this a situation that warranted a closer look. The maps of the mine were consulted over and over but it was felt that the distance between the lake, and mine were safe. The safety inspectors in the mine kept a very close eye on the leak as work continued. Towards the end of May in 1978, the leak seemed to have plugged itself, and very little water made its way into the mine from the crack. This development made the safety inspectors feel pretty good about things until a miner's wife had a dream. She dreamt that the whole of Lake Emma drained into the mine. Miners are by nature a superstitious lot ( I have been a member of this fraternity so feel comfortable saying this) so this caused quite a stir. Eventually the miners refused to work near the fault. The managers were of course upset and had the inspectors check the crack every morning for any change. All seemed well as the last shift left on Saturday the 3rd of June. Sunday dawned a beautiful day and everyone enjoyed their day of rest in Silverton. That evening at approx 6:50 P.M., things changed forever at the Sunnyside mine. The lake broke through into the mine. By the time it was over, the entire contents of the lake had drained into the mine. Tons of silt entered the mine destroying everything in its path. The Sheriff was summoned to the portal of the American Tunnel by a concerned citizen who indicated something was very wrong at the mine. As the Sheriff made his way up Cement Creek, he was met by a wave of water 8 to 10 feet high. The water was black and full of debris. After making his way across the swollen stream, the Sheriff met the night watchman and stood by to witness the scene at the mouth of the tunnel. A roaring torrent of water was emitting from the tunnel sending timbers and equipment into the air like missiles. After it was determined that no one had been at work in the mine, the Sheriff retreated to town to spread the bad news. The disaster, of course, closed the mine. Two years of back braking work were required to open the mine. The mine never regained its profitable status and eventually due to a poor metals market, was forced to close in January of 1985. Other companies made a try at operating the mine but all were unsuccessful. The magnificent Sunnyside closed for the last time in July of 1991 forcing the layoff of 150 miners. Head back down the gulch and view the upper side of the Tram angle house on your way.